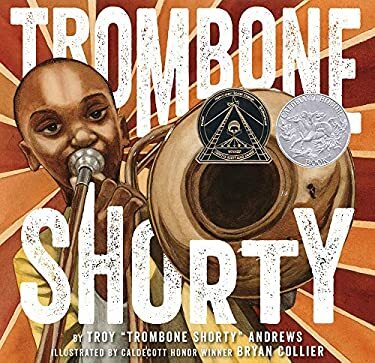 A 2016 Caldecott Honor Book and Coretta Scott King (Illustrator) Award Winner Hailing from the Treme neighborhood in New Orleans, Troy Trombone Shorty Andrews got his nickname by wielding a trombone twice as long as he was high. A prodigy, he was leading his own band by age six, and today this Grammy-nominated artist headlines the legendary New Orleans Jazz Fest. Along with esteemed illustrator Bryan Collier, Andrews has created a lively picture book autobiography about how he followed his dream of becoming a musician, despite the odds, until he reached international stardom. "Trombone Shorty" is a celebration of the rich cultural history of New Orleans and the power of music." Used Very Good (3 available) Former Library book. Great condition for a used book! Minimal wear. 100% Money Back Guarantee. Shipped to over one million happy customers. Your purchase benefits world literacy! New (113 available) BRAND NEW. Over 1.5 million happy customers. 100% money-back guarantee. Make your purchase count: support Better World Books' worldwide literacy partners.